Gilder Lehrman Collection #: GLC08963 Author/Creator: Woman Suffrage Party of the City of New York Place Written: New York, New York Type: Broadside Date: circa 1915 Pagination: 1 p. ; 25.5 x 18 cm. 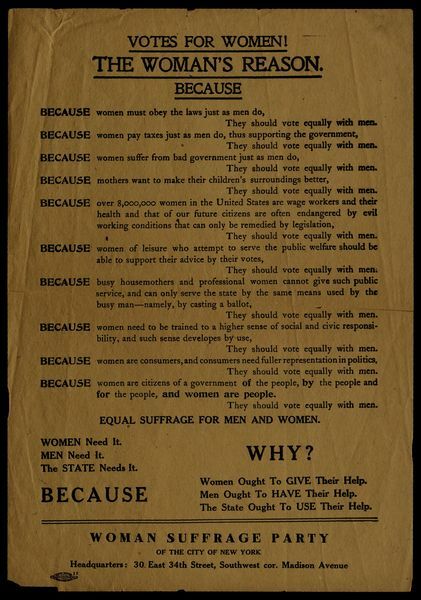 Summary of Content: List of arguments for why women should be allowed to vote, including "Because women must obey the laws just as men do, They should vote equally with men. Because women pay taxes just as men do, thus supporting the government, They should vote equally with men. Because women suffer from bad government just as men do...Because women are citizens of a government of the people, by the people, and for the people, and women are people, they should vote equally with men."